In this project we are again collaborating with the Guardian's Interactive Team. This time we are interested in exploring how journalists' use of Twitter can be facilitated in the context of reporting the London 2012 Olympic Games. As part of the Guardian's Second Screen we provide a real-time timeline view of Twitter traffic on the Olympics. 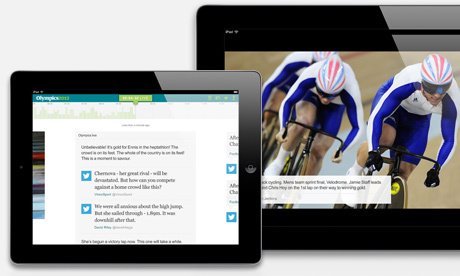 The idea behind the Second Screen is to provide a live stream of blog posts, tweets from the Guardian's Expert Network as well as pictures and results from the events. Users can view this stream in their web browsers on a desktop, tablet or even mobile phone. The Twitter timeline gives an indication of the amount of discussion on Twitter. Spikes in traffic are usually associated with key events such as the end of the Women's road cycle race in which Lizzie Armistead won the first medal for Team GB. Users who try to catch up with the day's events can use the timeline to find these events. Jonathan Richards wrote an article about the design of the second screen and the role of the timeline in it. A second part of the project is to provide a workbench for journalists that provides the same timeline display with added information such as the most retweeted messages, the most frequently used hashtags, most mentioned users and most shared links. This workbench allows journalists to find interesting content to include in the Second Screen. Over the course of the Games, we will be working closely with Guardian journalists to refine the functionality of the system and tailor it to their needs. A number of extensions to the initial protoype are in the pipeline and we are looking forward to trialling them under real-world conditions. For example, Miranda and Ewan in Edinburgh have been working on an incremental approach to clustering tweets to provide real-time insight into what topics are being talked about on Twitter and how many original contributions they attract. This complements our analysis of retweets, which focuses on individual posts that gain prominence. Alex has been writing the core Twitter mining and data handling code and is keeping a watchful eye on the live data collection and operation of the different parts of the system. Lars has written the user interface for the journalist's workbench and Ash has contributed to language detection and spam identification code. Rob and Phil have been studying journalist's work to inform the gathering of requirements for the project.